Home ›› Luggage Tips ›› Soft or Hard Sided Luggage? When buying luggage you need to decide whether you prefer soft or hard sided luggage. It used to be relatively easy, as there was clear difference between the two luggage types. But this has changed. If you wanted good protection and great durability, you went for hard-sided luggage. If flexibility, lightweight, and lower price were the most important factors, then soft-sided luggage used to be more suitable. Modern technology and innovative designs have changed this. Hard shell suitcases have become lighter and cheaper while softside luggage has become more durable, offering better protection than before. You can now get similarly durable, lightweight, and priced soft and hard-sided luggage. 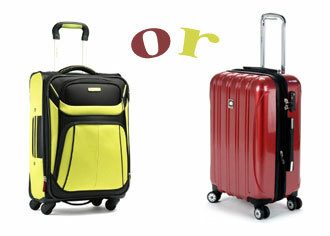 Whatever you go for, soft or hard sided luggage is now mainly a matter of preference. There are though still some fundamental differences between the two luggage types. Hard shell suitcases still offer the best protection so if you are travelling with fragile or valuable items, then hard case is always the best option. Soft bags on the other hand are more flexible and easier to maneuver, e.g. if you have to squeeze them into tight overhead storage lockers. The greatest benefit of soft-sided luggage is flexibility, making soft bags more packing friendly. It is easier to squeeze your stuff into soft bags. Even when they seem full, you can usually squeeze in some more items. Furthermore, softside luggage is frequently expandable, which can be very useful, e.g. when overdoing the shopping! Most soft luggage comes with some internal and external pockets and compartments, which can be beneficial when packing and can help you to stay organized. The external pockets on carry-on luggage are also great for things you want easy access to while travelling, like your book, snack, etc. You will also have more styles to choose from as soft luggage comes in all shapes and sizes. This versatility explains why soft-sided luggage is still the most popular option among recreational travelers. The main downsides of soft-sided luggage is the wear and tear, i.e. soft bags tends to "age faster" than their hard case counterparts. Soft-sided luggage material is susceptible for tearing and accumulates stain and dirt over time. Broken zippers can also cause a problem. The quality of the material does affect how long your soft bag will last. You can get soft luggage made from water resistant luggage material but most soft bags are not waterproof like hard shell suitcases are. Our article about best luggage material explains the difference between the most popular materials used in soft or hard sided luggage these days. The greatest benefits of hard-sided luggage are durability and protection. Your hard case will last you long time if well cared for. Hard shell suitcases also offer the best protection. So if you are travelling with fragile or valuable items, then hard case is always the best option. Hard-sided luggage not only has hard sides to protect what is inside. Hard cases are also waterproof and stain resistant, hence offering the ultimate protection. The most popular hard-sided luggage materials are polycarbonate, polypropylene, ABS and aluminum. All these materials are very durable but still lightweight, meaning both types of suitcases (soft and hard) weigh now similarly. Hard-sided luggage features have also improved drastically in recent years. You can now get all the latest features in soft or hard sided luggage, like telescoping handles, TSA approved locks and spinner wheels. The same applies about style, you can now get hard shell suitcases in any color imaginable and with scratch and dent resistant coating. The hard luggage interior design has also come a long way. Most hard shell suitcases now have dividers, pockets, and straps to hold your belongings in place. With tactful packing, hard cases can mean you arrive at your travel destination with less wrinkled clothes, which can be great benefit for all travelers but maybe not least for business travelers that have to look the part all the time. All these improvements mean hard-sided luggage is becoming increasingly popular luggage option among all kinds of travelers. The main downsides of hard-sided luggage are the lack of flexibility when you compare it with soft bags. It is not as easy to squeeze extra items into hard cases and they do not extend. There are also no external pockets for the things you might want quick and easy access to (or just use for some extra items). This lack of flexibility can be especially inconvenient when flying with a hard case carry-on bag. If your hard case bag does not fit in the available overhead storage bin, then it does not fit. There is no use trying to squeeze it in place, it will not budge. Hard shell suitcases are very durable and can tolerate a lot. However, if mistreated, then your hard luggage can become dented and as a result difficult to close. Moreover, if the siding cracks, then the hard suitcase is ruined. The pros and cons of soft or hard sided luggage are summarized in the below table. Price wise soft-sided luggage still tends to be cheaper, but both soft or hard sided luggage do come in all price ranges (cheap to expensive). To compare the price you must compare the overall quality of the luggage. Check out B for Bag selection of soft and hard sided luggage In Our Luggage Shop for any occasion.